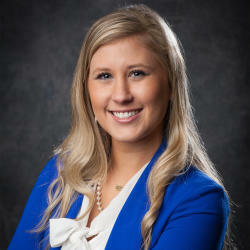 Kelsey Ball is the Program Coordinator for the Leadership and Small Business Programs at the Greater New Braunfels Chamber of Commerce. In her position, she is responsible for assisting with the Business Trade Show, Small Business Week, Military Affairs, Business Advisory, and organizing the Leadership New Braunfels Youth, Adult and Alumni programs among other programs, projects and events. Kelsey has earned an Associates in Accounting and a Bachelors in Business Management from Texas State University in San Marcos. After graduating Kelsey accepted a position as a store manager at a local department store in San Marcos. After a year of helping people find a great outfit for their fun events she realized she wanted to be a part of these great events and get involved in the community. She has now been with the Chamber for almost two years. Kelsey is a member of the Jaycees, New Braunfels’ young professionals group, and most recently has been selected for the Leadership Class of 2018. Born and raised in Houston, Kelsey moved to New Braunfels as fast as she could, where she met her now fiancé, Kyle Reichert. Kyle and Kelsey are set to be married in April of 2018 at Kelsey’s family property in Bellville. They plan to buy a house in New Braunfels with their two dogs, Khloe and Kricket, and one day raise their family here. If you could time travel, what time period would you visit first? 20 years into the future, to see all the things I will have accomplished throughout my life. Who is your all-time favorite musician or band? I love to karaoke to some Whitney Houston!